Australia's Largest Range of Dirt Bike Gear, Parts & Accessories. 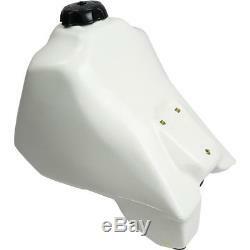 Clarke Racing NEW Mx Yamaha YZ490 86-92 14L White Oversize Motocross Fuel Tank. And has been producing tanks for the powersports industry since 1965. Unique tool-making process produces an unmatched factory finish and the highest quality product available. With over 40 years of experience producing plastic fuel tanks, Clarkeâ?? S line of standard and oversized fuel tanks set the standard for quality and fitment. Each tank is designed to your specific make and model of machine for a precision fitment. T have to modify your plastics or change your riding position. And with a variety of colors and sizes you can find the right Clarke Fuel Tank to keep you riding all day. Some tanks will require a Clarke Fuel Tank Cap, which will be included with tank. Some tanks, however, will accept your stock OEM fuel tank cap. Please don't hesitate to contact our customer service team on 1300 871 290 if you have any concerns regarding your tank cap. Designed to fit your specific make and model of motorcycle. Uses stock petcock and mounts. Australia's home of motocross gear, accessories and lifestyle products! With humble beginnings, a few mates got together with the vision to tackle motocross gear online in Australia. The challenge was set to trump offshore competition, bringing back faith to Australian our motocross customers online. Our Gold Coast warehouse is the only one of it's kind in Australia and is bursting at the seams with the latest dirt bike gear, motocross gear, parts and accessories. We endeavour to get you your products as soon as possible to ensure your experience with us is nothing but awesome! Please use due diligence in checking hard parts for correct fitment before removing from the packaging. Items, like chains will not be accepted once they have been removed from their clear plastic packages. You should usually be able to compare the new item with old/broken item while it is still in the manufacturers packaging. We do understand that this is unavoidable in some circumstances. We endeavour to get you your products as soon as possible to ensure your experience with us is nothing but awesome. We appreciate your business and will always give extra value as a gesture of this appreciation. To let you in on a little secret, we report on the amount of items that get dispatched on the same day and reward our team for achieving the highest of results. Dispatch is based on items leaving our Gold Coast warehouse. If this is an issue, we will always ensure we fix this for you and make your day for the inconvenience. 48 Dover Drive, Burleigh Heads, QLD AUSTRALIA. The item "Clarke Racing NEW Mx Yamaha YZ490 86-92 14L White Oversize Motocross Fuel Tank" is in sale since Friday, August 31, 2018. This item is in the category "Vehicle Parts & Accessories\Motorcycle Parts\Air Intake & Fuel Delivery\Fuel Tanks". The seller is "mxstoreaustralia" and is located in Burleigh Heads, QLD. This item can be shipped to Australia, North, South, or Latin America, all countries in Europe, all countries in continental Asia, New Zealand.